The Best Greek Food blogs from thousands of top Greek Food blogs in our index using search and social metrics. Data will be refreshed once a week. Also check out Greek Food Youtube Channels. 2.35 Little Cooking Tips | Easy to cook hard to forget! 2.37 Authentic Greek Recipes | Traditional Greek food as cooked by Greek mothers!! Greek Food newsletter is a comprehensive summary of the day's most important blog posts and news articles from the best Greek Food websites on the web, and delivered to your email inbox each morning. To subscribe, simply provide us with your email address. Greece About Blog Akis Kitchen is a real multiplex of creation and endless Greek and Mediterranean flavors! Facebook fans 605,664. Twitter followers 378,931. Athens, Greece About Blog The Greek Mediterranean Diet, Food, Recipes, Tips and more... from Greek-American Registered Dietitian Nutritionist Elena Paravantes. Facebook fans 11,657. Twitter followers 2,452. Boston, MA About Blog GreekBoston.com features some of the most popular and authentic Greek food recipes. Facebook fans 31,230. Twitter followers 12,605. Borough Market, London About Blog Oliveology is all about the traditional Greek diet based on olive oil and olives, fruit, vegetables, grains, legumes, and herbs that is considered one of the healthiest in the world. Facebook fans 1,634. Twitter followers 1,829. United States About Blog Welcome to Dimitra's Dishes. Here, she will teach you just how much fun and easy it is to please a crowd with my versions of Greek classics. Facebook fans 1,251. Twitter followers 32. About Blog A blog dedicated to Mediterranean food, recipes, sweets and more. Facebook fans 198. Twitter followers 50. About Blog On this blog Mia Kouppa shares her experince of Cooking with her parents, measuring, documenting and sharing traditional Greek recipes. Facebook fans 3,476. Twitter followers 63. Bielefeld, Germany About Blog Greek Cuisine Magazine offers its readers in several headings information, Tips and tricks on the culinary and lifestyle of Greece. Food & beverage and lifestyle travel are the focus here. Facebook fans 5,662. Twitter followers 193. Athens About Blog This site is all about Greek food! easy Greek recipes, yogurt recipes, Mediterranean diet recipes, Greek desserts, traditional Greek recipes,and healthy Greek food recipes. Facebook fans 867. Twitter followers 428. San Francisco, CA About Blog Share all things Greek & Mediterranean; Food focus but can include regional history, products, recipes, photos, diets and more. Facebook fans 1,095,125. Twitter followers 477,583. Athens, Greece About Blog The Greek Gastronomy Guide highlights the values ​​and commons of the gastronomic culture of Greece. It aims to inform its visitors about all the values ​​and goods of our gastronomic culture. Places, products and people, history and tradition, events and rituals, shopping, flavors, recipes and local cuisines unfold in front of you in such a way that each place is set up as a gourmet destination. Facebook fans 13,279. Twitter followers 67. Facebook fans 91,109. Twitter followers 17,586. Toronto About Blog Kalofagas offers the finest in Greek food and Greek recipes. Its mission is to promote Greek cuisine, wines, spirits and unique Greek ingredients. Facebook fans 18,632. Twitter followers 11,471. Nafplion, Greece About Blog Ivy Liacopoulou is the author of Greek Home-style Cooking and Culinary Instructor.The majority of its recipes are based on Greek cuisine and the Mediterranean Diet, which is one of the healthiest in the world, using fresh, wholesome ingredients. Facebook fans 2,307. Twitter followers 2,203. Glasgow, UK About Blog Agora was formed to provide all the Greek foods and drinks to the UK market and bring people closer to genuine Greek foods and drinks! Facebook fans 3,209. Twitter followers 718. Chicago, Illinois About Blog OMGfood have a stronger focus on Greek and Mediterranean cuisines because it’s what I ate a lot of growing up. Facebook fans 621. Twitter followers 1,311. Facebook fans 1,730. Twitter followers n/a. The Netherlands About Blog Follow this blog where a greek food blogger, who is raised in the United States shares Traditional Greek Recipes, Simple to make Scrumptious & Delicious. Facebook fans 132. Twitter followers 3,629. Las Vegas, NV About Blog Meráki Greek Grill, a Greek restaurant in Las Vegas ensures excellence by using the highest quality meats and seafood, fresh garden vegetables, and quality artisan breads to combine for a homemade meal for lovers of Greek food. It offers an eclectic menu of Greek entrée classics. Facebook fans 611. Twitter followers 8. Athens, Greece About Blog Blog with cooking recipes, DIY constructions and home-garden decoration ideas by Ioanna Baltsaki. Facebook fans 609. Twitter followers 1,617. Facebook fans 2,590. Twitter followers 8,036. About Blog Live longer and happier with Greek recipes, fitness, lifestyle tips and products inspired by the Greek Island Kitchen. Facebook fans 191. Twitter followers 11. Facebook fans 429. Twitter followers 9. UK About Blog This blog will give you an insight into my gluten free living, with recipes, places of interest and reviews on gluten free products straight from the shelves! All with a Greek-twist of course! So whether you are a coeliac starting your new gluten-free life or simply want to cut down on the amount of gluten in your diet, I hope that my blog will help you. About Blog Greek Cooking Made Easy Videos are for young people and anyone interested in learning Greek cooking easily. Facebook fans 389. Twitter followers n/a. London About Blog The Greek Food authored by Antonis is a blog where you can read Greek traditional recipes as they were taught to her by her mother and learn more about Mediteranean cuisine. Facebook fans 308. Twitter followers 344. About Blog As a Greek, of course I love Greek cuisine and Mediterranean dishes, I have grown up with these tastes, so I learned and cooked. If we ask the people who know me better what is my greatest weakness, they will say with one mouth a voice: FOOD! They will also tell you how I cook very well! I will share with you my diary, mainly Greek cuisine, as well as food that I enjoy traveling or eating out. Facebook fans 910. Twitter followers 6. Charlotte NC About Blog This blog will provide a window into the wonders of Greek cooking, the importance of good ingredients, the joys of home gardening, and the fun of food and travel. Facebook fans 342. Twitter followers 713. New York About Blog Kukla's Kouzina: A Gourmet Journey~Greek Island Style--A cookbook featuring a collection of over 150 recipes inspired by the southern Greek island of Karpathos. Facebook fans 538. Twitter followers 2,090. The Netherlands via Greece About Blog I'm Magdalini. I am from Greece, born and bred in Athens, and for the last eight years I have been living in The Hague, Netherlands with my also Greek boyfriend, S. I share recipes and stories about Greek food with the world. The recipes featured on her blog range from traditional Greek recipes (naturally), to modern international ones. Facebook fans 4,949. Twitter followers 505. Boston About Blog Kiki a Greek American girl cooking authentic, traditional Greek vegan food with her father as a head recipe tester and pot washer at The Greek Vegan. Facebook fans 22,787. Twitter followers 1,007. Southern California About Blog Lemon & Olives is a Greek food blog dedicated to providing delicious recipes and healthy Mediterranean lifestyle tips. Facebook fans 12,613. Twitter followers 1,356. Greece About Blog Explore the Greek/Mediterranean culture and delicious lifestyle and own 68 of the most authentic Greek recipes from MyGreekitchen. Facebook fans 7,532. Twitter followers 172. Lefkada, Greece About Blog Fotini Gazi opened this Greek food blog, to share with you all the classic Greek recipes and how to cook Greek food. Facebook fans 50. Twitter followers 552. 35. Little Cooking Tips | Easy to cook hard to forget! Athens, Greece About Blog Mirella & Panos loves to cook recipes from the Greek and Mediterranean cuisines. On this blog they share their traditional, Greek and Mediterranean recipes with touches of flavors, aromas and spices from around the world. Facebook fans 1,170. Twitter followers 3,212. Facebook fans 1,090. Twitter followers 84. 37. Authentic Greek Recipes | Traditional Greek food as cooked by Greek mothers!! Corfu, Greece About Blog Welcome to Authentic Greek Recipes blog where you can learn how to prepare delicious, traditional Greek dishes from recipes used in the home by local mothers and grandmothers! A lot of them are well-known and others perhaps not so well-known outside Greece. Those are all recipes prepared by Maria. Facebook fans 12,077. Twitter followers 803. Wayland, MA About Blog A Day in the Bite is about Alexis's culinary adventures with Greek food and recipes. Facebook fans 1,361. Twitter followers 538. The Netherlands About Blog Greek foodtales was created based on the need we feel to promote the Greek food culture known for its richness in quality ,taste and nutritional value. Cooking is an integral part of our Greek mentality, lifestyle and culture and as people say "we are what we eat". Our goal is to explore and present this unique gastronomic treasure with a fresh and innovative approach. Facebook fans 3,706. Twitter followers 317. Hackney, London About Blog yaya supper club is about sharing homemade food, sharing a table with both friends and strangers and finding warmth and love in delicious greek food. This supper club is a chance to meet new people in the comfort of yaya’s (grandmother’s) dining room and feast on delicious greek dishes from recipes passed down to emily by the women in her family. Facebook fans 286. Twitter followers 1,042. Ghent, Belgium About Blog My name is Andreas Stavropoulos, I live in Belgium but I am from Greece and youvetsi is for me the link to my love for gastronomy but also a connection with the cooking of my mother and my culinary memories from sunny Greece. Facebook fans 97. Twitter followers 2. Switzerland About Blog Lisa's purpose is to share vegan recipes of the Greek traditional cuisine with people all over the world, vegan or not, interested in exploring new tastes. Argiroupoleos Avenue, Athens About Blog Greek Brands main goal is to provide top quality delicious dishes to the consumers. Facebook fans 268. Twitter followers 253. New York, Greece About Blog Diane Kochilas, Greek Chef, shares healthy Greek Mediterranean recipes from different regions of Greece and explores the richness and splendor of Greek food. Facebook fans 10,847. Twitter followers 7,085. Greece About Blog Follow this channel for Greek, Mediterranean food , Greek restaurants and the nightlife in Greece. Facebook fans 108. Twitter followers 367. 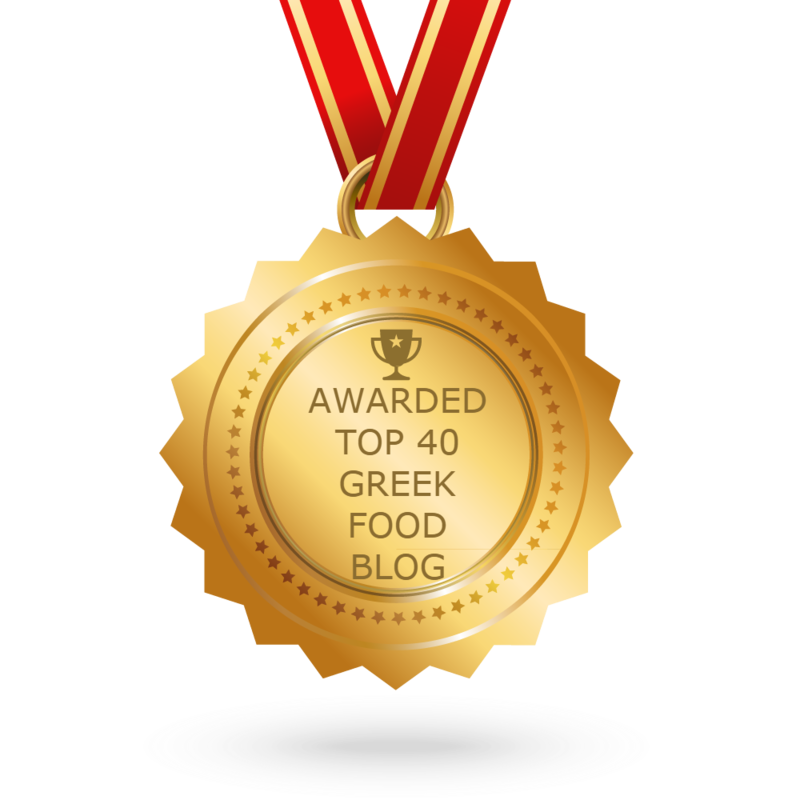 CONGRATULATIONS to every blogger that has made this Top Greek Food Blogs list! This is the most comprehensive list of best Greek Food blogs on the internet and I’m honoured to have you as part of this! I personally give you a high-five and want to thank you for your contribution to this world.